During the last two years that I have been teaching Environmental Science and attempting to explain global warming to my students, I have been frustrated at the lack of solid theoretical understanding of the primary processes coupled with actual data. Speaking as a research physicist, I have been saying to others, “Wait until the physicists get into action. They have an entirely different approach to solving physical problems”. Sure enough, two such physicists have published their analysis of their fundamental understanding of the climate. In October 2011 Nikolov and Zeller presented their analysis in a poster entitled “Unified Theory of Climate” at the World Climate Research Program in Denver. Their analysis was indeed from fundamental physical and mathematical principles. A month or so later their poster was converted into a document and appeared on Tallbloke’s Talkshop. From there it spread to WUWT and many other blogs, and it has generated a tremendous amount of discussion. I would like to add my two-cents to that discussion. It can be something of a difficult problem to define what is meant by the average temperature of the earth. Some have argued that there is no such thing as the “average” temperature; that temperature is a localized measure. However, temperature is a measure of the energy in a system, and energy can be averaged. UPDATE 24-10-13: Michele links a post which confirms his observations and predictions: Looks like Europe might be in for another very cold winter. This article is a copy in English from the Italian blog of Dr Michele Casati, http://daltonsminima.altervista.org by kind permission. I’ve paraphrased some of the auto-translation but left most of it as giving a better taste of the original writing – Tim. Back in January, hot on the heels of revelations regarding the Moon’s temperature made by Ned Nikolov on the WUWT thread discussing their ‘Unified Theory of Climate’, Willis Eschenbach published an article at WUWT entitled “The Moon is a Cold Mistress”. He used as his primary data source this NASA publication, in which the authors had developed a model using the old Apollo in situ data collected by thermocouples set in the regolith – the pulverised rock the Moon’s surface is covered in. The author’s did a pretty good job, their average surface T for the measurement location as stated by Willis is -77C, or 196K, which matches the latest DIVINER data very well for the Moon’s global average, a nice coincidence, partly caused by the choice of a temperate location for the Apollo mission to land in. 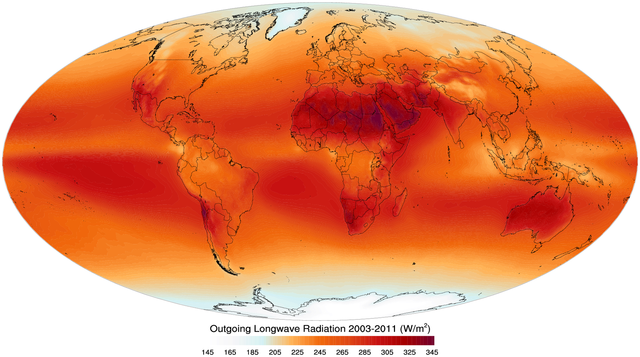 The first section of the article Willis raises some issues around understanding the relationship between incident solar irradiance and average surface temperature. Willis stated that various factors come into play which affect this relationship, including day/night swings, albedo, heat retention in the surface regolith, and speed of rotation. Well, at least I was right about one thing; the empirical data is the most important. 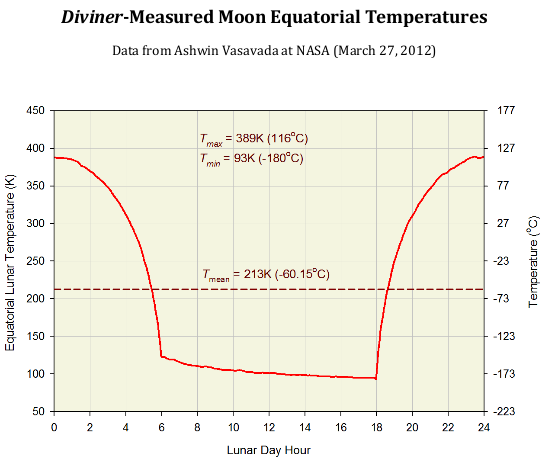 I’ve just had an update via email to say the latest empirical estimate of mean temperature for the Moon is 192-197K. This figure pretty much splits the difference between the old 255K and Ned and Karls theoretical figure of 155-157K. Karl says they will be working a regolith heat retention term into their equations. Ned Nikolov has kindly sent me a plot of the diurnal lunar equatorial temperature profile as determined by MSU observations carried out by the DIVINER instrument carried on board the NASA’s Lunar Reconnaissance Orbiter. Miles Mathis: What Causes the Earth’s Heat? UPDATE: A huge thanks to ‘Wayne’ who has fixed the formatting for this article. What Causes the Earth’s Heat? Abstract: I will briefly critique the current theory of Earth’s heat, including core theory and nebular theory. Then I will show you that the Earth’s heat is actually caused by charge, proving it by calculating the total heat content of the Earth straight from the fundamental charge—in about four lines of math. In a recent paper I confirmed for the third time that the charge field should peak in the infrared. Using a new round of equations, I showed that we must look for charge at energies beneath the visible. So I will open this paper by expanding on that a bit. Norfolk Constabulary have previously released details of their spend on the UEA emails investigation – Operation Cabin. This showed that no money had been spent on the investigation since February 2011, something that strongly suggested that the investigation was in fact closed. Despite this, the Constabulary insisted that the investigation was ongoing. Trying to find the key configurations and cycles which have the strong effects is a bit like doing a cryptic crossword. The clues don’t at first seem to help obtain the answers. They help confirm you got the answer right once you’ve got it. 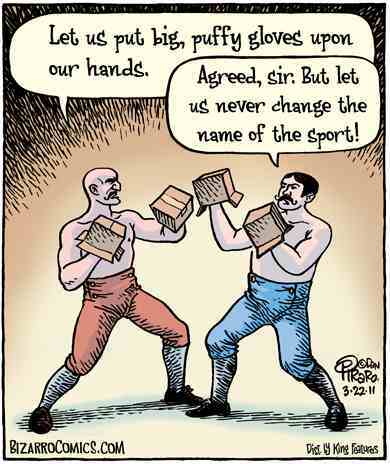 Analogies can be pushed too far, and there is of course no ultimate certainty. Nature doesn’t print the solution to the crossword in the heavens the following Saturday morning. However, those of us who have been getting on with the job instead of throwing up our hands in despair at the myriad numbers of cycles or loudly proclaiming the impossibility of the planetary effect on the strength of spuriously extrapolated ‘first principles’ have been making some good progress. 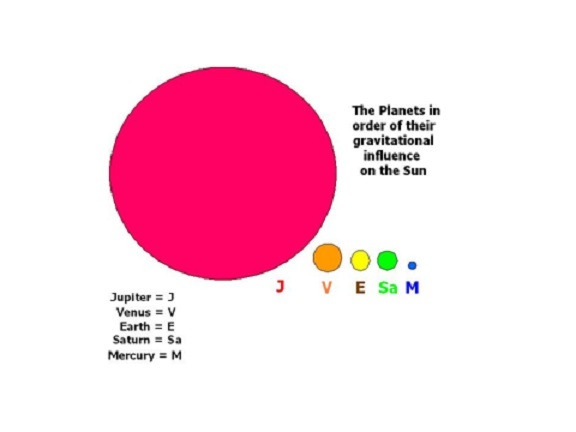 This article looks at some of the principle harmonics in the solar system. 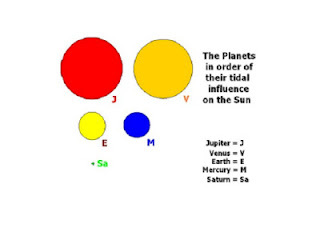 The Jupiter-Saturn-Earth direct relationship to the Solar cycle of around 11 years and solar rotation has been recently dealt with so is left out of this discussion. The recent warming has been entirely a result of declining cloud cover and related cloud albedo. show why my competing theory that the recent warming was entirely a result of stored ocean heat releases is wrong, or otherwise show how the heat releases were triggered by cloud albedo changes. Few things in the universe seem as constant as the sun. But now scientists have discovered that two parallel layers of gas deep beneath the solar surface are actually speeding up and slowing down in a strange, synchronous pattern. 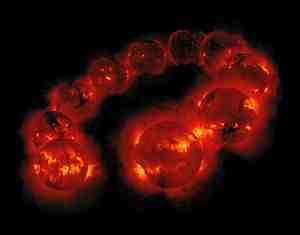 It turns out that, as the sun rotates on its axis, one gas layer gradually spins faster while the other reduces speed. Scientists are at a loss to explain the phenomenon, which occurs in regular 12-to-16-month cycles. Schou is part of an international team of researchers using satellite and ground-based observatories to monitor the sun. Writing in the March 31 issue of the journal Science, Schou and postdoctoral fellow Rasmus Larsen point out that these unusual but predictable changes in rotational speed only occur above and below a section of the sun known as the interface layer or tachocline. Located about 135,000 miles below the solar surface, the tachocline separates the sun’s two major regions of gas: the radiative zone, which includes the energy-generating core, and the convective zone near the surface. Solar experts believe that the tachocline may be the source of powerful magnetic fields that produce strong solar flares and solar winds, and create sunspots that mysteriously appear and disappear during an 11-year cycle. No one knows how the sun’s enormous magnetic fields are generated, or why they reverse polarity from positive to negative every 11 years. 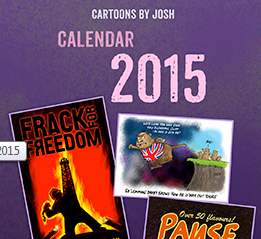 visit http://cartoonsbyjosh.com - and buy a mug or something. 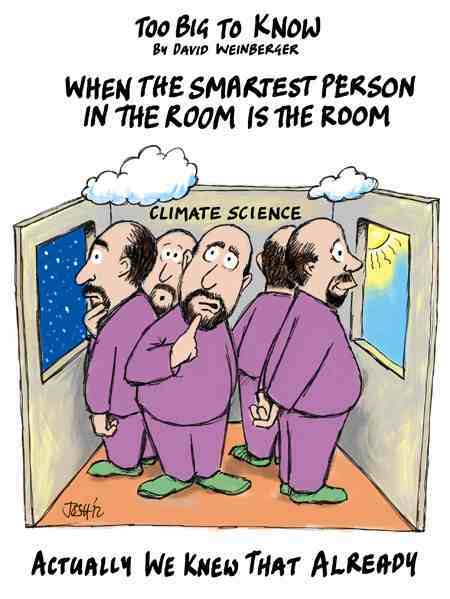 Most people, including many scientists, have been fooled by the pseudoscience that is hidden in the climate models. Every single result produced by the use of radiative forcing is invalid. The results from all of the models that use the empirical radiative forcing constants given by the IPCC are fraudulent. The assumptions made in the derivations are clearly stated on the second page. The Earth’s climate is stable, which means that there is an approximate energy balance between the incoming solar radiation and the outgoing LWIR flux somewhere ‘at the top of the atmosphere’. This is simply a statement of the First Law of Thermodynamics. The energy is conserved – more or less. However, this does not justify the assumption that an ‘average climate equilibrium state’ exists in which the solar flux is exactly balanced by the LWIR flux. Today a magnitude 7.6 earthquake struck Acapulco the Oaxaca region around a hundred miles east of Acapulco; our hearts go out to all those affected by this Earth shaking event. Michele has been working on developing the methods originated by Rafaele Bendandi in the early half of the C20th. My thanks to Verity Jones for permission to repost this article by Peter ‘gallopingcamel’ Morcombe from her blog ‘Digging in the Clay’ which always carries well researched and written posts. Peter extends Ned Nikolov and Karl Zeller’s work to include a look at the gas giant outer planets in this piece, as well as commenting on other matters arising from their work. Peter refers to them with an abbreviation of their first names (N&K) throughout. In October 2011, Ned Nikolov & Karl Zeller (N&K) published a poster called the ‘Unified Theory of Climate’ (Direct link to Poster) claiming that planetary surface temperatures can be calculated accurately if pressure and TSI (Total Solar Irradiance) are known. If their claim is correct, so-called ‘Greenhouse Gasses’ such as carbon dioxide are not responsible for the observed ‘Global Warming’ since 1850. This has major implications with respect to energy policies worldwide. These ideas are hardly new as PaAnnoyed, Steven Goddard, Harry Dale Huffman, Leonard Weinstein, gallopingcamel and others have made similar assertions. N&K boiled it all down to a few equations. Their claims are being hotly debated with critics dismissing it as sophisticated curve fitting. While that makes me wonder whether those critics bothered to read the N&K poster, I have some criticisms of my own. Beware: Trees are on the move! 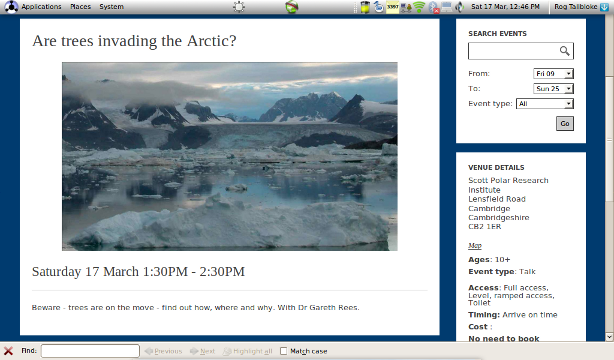 This event taking place in half an hour from now at Cambridge University’s science festival sounds a bit alarming. Are the Ents going to get us?? There is a wealth of Swedish meteorological data since about 300 years ago which has been read 3 times a day at 7 AM, 1 PM and 7 PM. Added to that minimum and maximum temperatures are collected. The variables are pressure, air temperature, water vapor pressure, relative humidity, wind speed , wind direction , cloudiness (a scale 1-8 parts of sky covered by clouds), precipitation, snow cover depth and general weather (raining, snowing mist etc.). For a long time such data could be bought in a yearly book “Meteorological Observations in Sweden” covering data from 14 of the biggest Swedish stations until they stopped producing them and I think that 1977 was the last year of publication. The accumulated amount of meteorological data that exists in Sweden is just staggering. The preoccupation with one single meteorological variable such as global temperature is misleading in several ways. The physics in the atmosphere only works in real time at a specific place. Any averaging destroys or limits the possibility to identify and check the processes at hand in the real atmosphere. It is also necessary to observe several variables at the same time to develop well found ideas about how the physical processes interact with each other and which ones are dominating at specific times and places. To do this prime data times series are of profound importance. Such series are found in abundance in the excellent publication “Meteorological Observations in Sweden”. I personally own this publication from 1922-1977. By chance I found an old chart I made at least 30 years ago which you can see below. It shows wind, cloud and temperature time series from Karesuando during four months, January, March, July and November. Karesuando is situated quite far above the polar circle so during January there is no solar irradiation at all reaching the station. Rog asked about the results of my peeking at the SST2 leading UAH TLT data where I replied it is unsafe but of interest. Well he did ask a leading question.